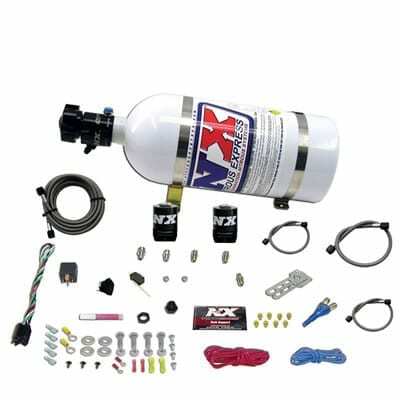 This system includes a single Shark nozzle, nozzle mounting bung, Lightning series solenoids, 24in D-3 stainless braided solenoid to nozzle lines, 15 Foot D-4 stainless braided nitrous feed line, 18in D-4 fuel feed line, nickel plated fittings, wide open throttle switch, master arming switch, 40 Amp relay, relay harness, Ford fuel rail fitting, stainless bottle brackets and a 10 lb nitrous bottle with the Lightning 45 bottle valve. This system includes jetting for 35, 50, 75, 100 and 150HP. The system can be easily upgraded later to support up to 250HP.